Anti-BCR-ABL TKIs (tyrosine kinase inhibitors) are drugs that inhibit BCR ABL tyrosine. They are used especially in the treatment of hematological cancer and gastrointestinal stromal tumors (GIST). Anti-BCR-ABL TKIs include first (imatinib), second (nilotinib, dasatinib, bosutinib) and third-generation drugs (ponatinib). Especially second- and third-generation drugs can cause cardiovascular complications such as arterial thrombosis, myocardial ischemia, peripheral arterial diseases, QTc prolongation, and pulmonary hypertension. Nilotinib and ponatinib can cause thrombotic arterial events with various mechanisms. Particularly dasatinib can cause pulmonary hypertension. Compared to conventional chemotherapy, myocardial dysfunction was found in a smaller number of cases. In this chapter, we will illustrate cardiovascular adverse effects induced by anti-BCR-ABL TKIs, the main mechanisms that could explain such effects, and the influence played by cardiovascular risk factors. 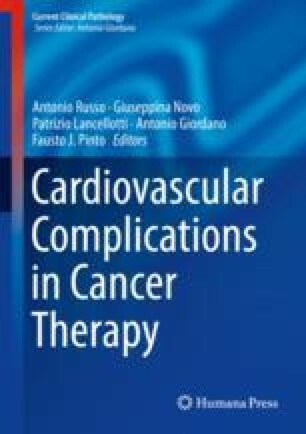 It is essential for both cardiologists and oncologists to know these issues in order to develop appropriate monitoring and apply preventive strategies to avoid the occurrence of toxicity and the need of any premature interruption of the antineoplastic treatment. Tocchetti CG, Cadeddu C, Di Lisi D, Femminò S, Madonna R, Mele D, et al. From molecular mechanisms to clinical management of antineoplastic drug-induced cardiovascular toxicity: a translational overview. Antioxid Redox Signal. 2017; https://doi.org/10.1089/ars.2016.6930.